The Yankees made a feeble move on Thursday to shore up their pathetic situation at first base. They've already cut Chris Carter, missing person Matt Holliday appears to be on a permanent holiday and Greg Bird might as well be playing in French Lick for all the good he's done them in the Bronx. The overall production from the first-base position this year for the Yankees has been nothing short of abysmal. So, The Evil Ones traded away a marginal relief pitcher (Tyler Webb) and got back a minor-league first-baseman (Garrett 'Don't Call Me Cecil' Cooper). Yawn. 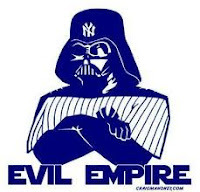 Tomorrow night The Pinstriped Posers come to Fenway Park for a week-end series that could prove interesting.